Free Microsoft download of Internet Explorer 10 for Windows 7 is finally released for Windows 7 operating system users. Windows 8 is running Internet Explorer 10 ( IE10 ) as the build-in web browser. Windows 7 users who want to try the newest web browser IE10 from Microsoft could download Internet Explorer 10 Platform Preview version (IE10 Platform Preview) and install it on their Windows 7 computers. Although IE10 Preview version had been available for download a short period after the IE9 release date, we have waited for long enough for the final release for Internet Explorer 10 for Windows 7. Besides Microsoft's Internet Explorer Google Chrome is preparing to release Canary web browser, the beta version of next Chrome browser. And with renewed browsers, the support for HTML5 is getting stronger. So the race for being the best HTML5 web browser is also. Unfortunately there is only a slight difference between Internet Explorer 10 Platform Preview release and final release of Internet Explorer 10 for Windows 7 considering the HTML5 support capabilities. You can compare HTML5 browser support test scores at given reference document. Windows 7 users can free download Internet Explorer 10 for Windows 7 from Microsoft Downloads. In the given IE10 download page, you will find different Internet Explorer 10 download files for each language supported. Also there are 32-bit and 64-bit builds for Windows 7 and also for Windows Server 2008 R2 SP1. It is important to note that Service Pack 1 is a requirement for Microsoft Internet Explorer 10 on Windows 7. And it is best to install all Windows Updates before you download IE10 and install it on your Windows 7 running PC. 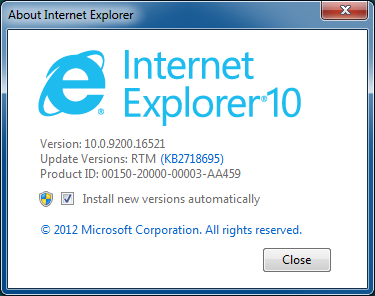 Please note that Internet Explorer 10 is not supporting any Windows version earlier than Windows 7 SP1. This means if you are running Windows XP or Windows Vista, you will not be able to install the Windows Internet Explorer 10 on your PC. If you download Internet Explorer 10 and install IE10 on your Windows 7, I will suggest you to visit Internet Explorer Test Drive web site to view which kind of web applications your new internet browser is capable to run. Of course if you have a Windows 8 PC or tablet, you can also visit Test Drive web portal to see the capabilities of most recent web browser Internet Explorer 10 from Microsoft.